Americans across the country have continually debated whether or not illegal immigration is an issue that severely impacts our nation. Hector Regalado, a recently retired Border Patrol agent, decided to help set the record straight. Mr. Regalado spent 23 years with the Border Patrol. He’s been stationed in Imperial Beach, California; Naco, Arizona; Nogales, Arizona; Grand Forks, Minnesota; and Spokane, Washington. He’s held various positions, including Senior Patrol Agent, Resident Agent, Supervisor for the Resident Agent Program, Special Operations Supervisor, Special Projects Supervisor and Public Affairs Supervisor. Most Americans fail to realize the number of Border Patrol agents that are stationed in the northern part of the United States. The program, called the Resident Agent Program, puts one to three agents (and in some places, up to five) in small communities to gather relevant intelligence. These agents work with local law enforcement and officials to help in cases they’re undermanned/unequipped to handle. The program is currently taking place along the northern border in North Dakota, South Dakota, Minnesota, Wisconsin and in various parts of Florida. But Regalado brought up an excellent point: we don’t hear about the practices taking place along our northern border because of the economic differences between Canada and Central America. In fact, the majority of the arrests that take place on the northern border aren’t people from Canada. Would a Border Wall Really Work? One of the dangerous aspects along the border near San Diego has to do with the terrain. One such danger is the Tijuana River that flows from Mexico into Imperial Beach. The problem with that is the lack of regulations in Mexico, meaning dangerous toxins and chemicals are being dumped into the river. “A lot of their waste from factories get poured right into that river and it flows north. That stuff is toxic, extremely toxic,” Regalado said. People are walking and swimming through those waters to get to the United States. And Border Patrol agents are putting themselves at risk when they’re having to step in those waters to go after illegal aliens. But again, that’s something the mainstream media won’t tell you. Did President Trump Break Humanitarian Laws? One of the biggest misconceptions and misrepresentations the mainstream media has pushed though, is the idea that President Donald Trump violated humanitarian laws through his various immigration policies, including child separation. It’s something Regalado said is simply untrue. “Border Patrol goes above and beyond what the letter of the law states,” he stated. When a family unit is brought into custody, Border Patrol immediately evaluates them for health issues. “Most of these people weren’t sick when they started their journey but look at how far they’ve had to travel to get to the border. On their travels they are encountering people who are ill and they themselves pick up an illness,” Regalado explained. Illegal aliens are evaluated for health issues and are taken to a hospital to be treated if necessary. After that, they are processed. While Border Patrol decides how to handle the family unit, they are separated from the general population. If a juvenile is present, agents monitor the family every 15 minutes to make sure they have food, water and any other necessities. And the “fake families” we’ve heard of crossing the border isn’t a figment of our imagination. It’s happening. Before the illegal aliens make their trek to America, a coyote will look through the group, identify a woman and her child and give them very clear instructions. “The coyote tells them, ‘If we’re arrested, you’re my wife and you’re my child,’” Regalado said. At the end of the day, the coyote is only worried about one thing: themselves and their business. Coyotes know that once they say a child is theirs an investigation must take place. Border Patrol agents have to find out if the child is really his, especially if it’s just a man claiming to have a child. “If there is a mother and a child, it’s a little harder to recognize that they aren’t together. But there are clues and we do keep an eye on them closely. If they slip up and show they’re not really together, they will separate them and interview them,” he said. Agents will ask basic questions if they suspect they are lying about being a family. Where is the child from? How old is the child? What’s the child’s middle name? When did you get married? What’s are your in-laws’ names? If a person can’t answer those basic questions, it becomes obvious to agents the family is indeed fake. Are Illegal Aliens Really Trying to Seek Asylum? The Left has continually pushed the notion that those who are flocking to America, like in the Central American caravan, are doing so to seek asylum, something Regalado said is the furthest thing from the truth. For starters, the number of people who are seeking asylum isn’t all that common. But those who are seeking asylum do so at the port of entry. They don’t try to enter the country illegally. “If they’re going through the desert, their intentions weren’t asylum. If their intentions were to file asylum, they know the rules,” he said, one of which is to go to a port of entry to file the appropriate paperwork. What’s shocking is other countries report about how to get to America and how to file asylum. Most people don’t know that the process of asylum is grueling and long. And there are officers who do nothing but process asylum requests. 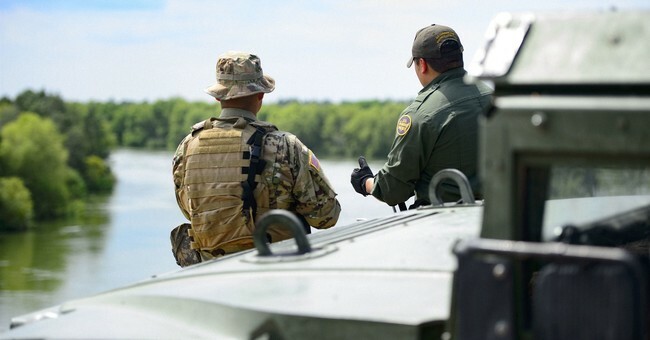 Border Patrol agents and Customs officers take basic biographical information about where the person is from as well as running background checks for criminal history. But then the case is turned over to the Asylum Officer. Regardless of what the initial agent finds, all individuals get a second interview by an asylum officer, which falls under USCIS (U.S. Citizenship and Immigration Services). “It’s not just a snap of a finger and you’re in. They do a lot of background work to identify the person that is claiming asylum, the country they’re from and the situation they’re claiming,” Regalado said. After the second interview, asylum officers decide if the story is credible. Officers work with the State Department and the country the person is from to verify information. Once it’s verified, the officer then makes a determination. The officer has three options: grant asylum, deny asylum or grant an extension. Generally, extensions are given when the officer can’t verify a person with 100 percent certainty but there’s a possibility what they said is true. Are Terrorists Really Coming Across Our Border? One of the main reasons to vet people is to make sure terrorists are kept out of our country. “We don’t want to have terrorists come in. We don’t want to have an MS-13 gang member. We don’t want to have any of these cartel members coming into the country and establishing a drug trade route,” Regalado said. And while we know the amount of drugs that are coming to the United States is high, none of us truly know the extent of it. On a daily basis, agents are pulling over cars that have 1,500 to 3,000lbs of marijuana in a regular pickup truck. In FY2017, agents in the Tucson sector alone captured just under 400,000lbs of marijuana. And that’s just one very small area along the border. While drugs are one major issues with our southern border, terrorism is another facet we can’t ignore. But again, this is where things get murky. Border Patrol isn’t responsible for classifying someone as a terrorist. They have “Special Interest Aliens,” which means a person originates from an area known for terrorism, like certain countries in the Middle East. A final determination about whether or not someone is indeed a terrorist rests with other agencies such as the FBI or HSI, agencies that have been given this specific task. What Resources Does The Border Patrol Lack? “We don’t have enough agents. Even with 25,000 agents, you’re still not able to completely and effectively control every single bit of land or waterway that we need to patrol,” he said. Although technology has gotten better, the retired agent said the agency is still behind the times. Going out into rough terrain, where they spend most of their time, it can be dangerous when they’re on their own without backup. It makes things even more dangerous when they have radios that don’t function in the mountains or deep in the valleys. The radios are basically useless. “Technology is starting to roll in a little at a time but it still lacks,” Regalado said. There you have it folks. Straight from the horse’s mouth. We need a wall. We need more agents. And we need tightened border security.